Begola Wetland is still almost completely dry so we need a lot more precipitation, but at least the water tanks have filled up.I’ve spent way too much of my time over the past few weeks at the Geelong Botanical Gardens trying to photograph rufous fantails. I love these little birds and one day I will hopefully take a decent photo of one, but they tend to be found in dark areas under a thick canopy of trees, and they don’t stop moving, so they are nearly impossible to (decently) photograph. Rufous fantails are tiny (16cm in length) and they move northwards in winter when they virtually disappear from Victoria and New South Wales. While I was chasing rufous fantails around the botanical gardens I saw a flock of around 30 yellow-tailed black cockatoos fly over, and when I looked closer there was a collared sparrowhawk flying among them, stirring them all up. I also spotted a female rose robin and a white-headed pigeon. I’ve seen many of these pigeons in Bermagui, NSW, so I knew what it was straight away. The white-headed pigeon is a large pigeon with a white head, neck and breast. The back, wings and tail are dark grey to black and the underparts are grey. The eye ring is pink to dark red and the legs and feet are also pink. 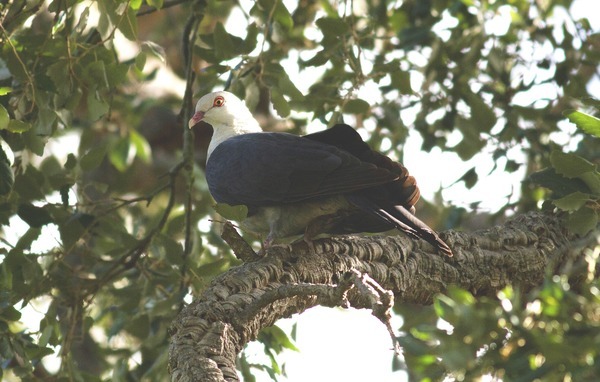 The white-headed pigeon is found east of the Great Dividing Range from far north Queensland to southern New South Wales, but increasing numbers have been seen in eastern Victoria, including in Anglesea, Ocean Grove, and now in Geelong over the past few years. 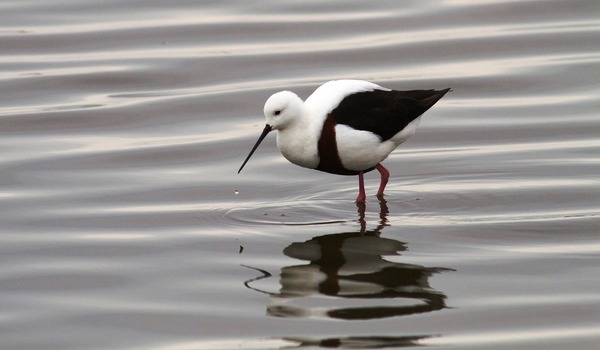 I had one quick drive through the Western Treatment Plant over the past few weeks, and the highlights were spotting a large flock of banded stilts and five brown quail at the T-Section Lagoon. I’ve had a problem with large numbers of mice in my three aviaries over the summer. My humane mouse traps were no longer working as the mice had discovered how to escape from them. I was thinking of calling in a pest control person, as I don’t mind mice outside but hate them in the house, particularly in the kitchen, and the numbers of them were becoming a problem. However I should have known that a bird would come to the rescue, and I’ve had a very plump grey butcherbird living in my garden. I’ve only seen two mice this week which is better than 20. I’m sorry little mice, but you have gone to a good cause. An amazing sighting over the past few weeks was made by George Appleby, a member of the Geelong Field Naturalists, when he saw an oriental pratincole at Hospital Swamp. I remember when I saw my first Australian pratincole at Fogg Dam in the Northern Territory, and it was one of my favourite bird watching moments, so to spot an oriental pratincole around these parts is amazing. The oriental pratincole is a medium-sized (23cm long) tern-like shorebird with long, pointed wings and a forked tail. 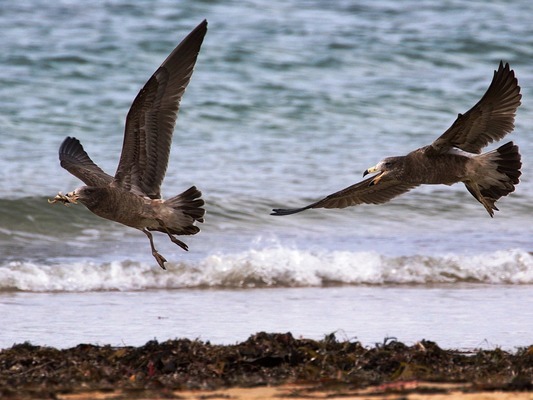 Within Australia the oriental pratincole is widespread in northern areas, especially along the coasts of the Pilbara Region and the Kimberley Division in Western Australia, the Top End of the Northern Territory, and parts of the Gulf of Carpentaria. It is also widespread but scattered in inland Australia. There are occasional records in southern Australia, at sparsely scattered sites, with records in all states, including an unconfirmed report in Tasmania. I’ve had lots of visits to the doctor lately so I obviously haven’t seen enough raptors (as we all know that a raptor a day keeps the doctor away) I have been fortunate to spot two collared sparrowhawks, a few black-shouldered kites, a few little eagles, nankeen kestrels and brown falcons over the past few weeks, which have been lovely to see. 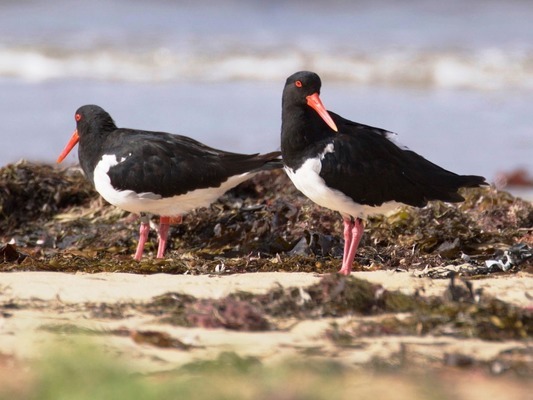 I received an email from Kevin, who sent me some great photos (that he took at Queenscliff) of a pair of pied oystercatchers and a pair of first year Pacific gull juveniles. One of the pied oystercatchers is banded, but I just couldn’t make out the letters on the band. Thanks so much Kevin for your email and observations. I also heard from Heidi in Wallington who is campaigning to try to prevent two ponds at the Homestead Lakes Nursing Home in Wallington. Heidi is trying to retain these habitats for the turtles, frogs and birds that live in the ponds, and she is very passionate, which is great.